List decoding is a decoding strategy that provides a set of codewords at the output of the channel decoder. Since this technique corrects errors beyond the correcting bound of the code, upper layers in the application or in the communications protocol can choose the appropriate candidate codeword among the elements of the set. The Koetter-Vardy algorithm is a soft-decision decoding algorithm for Reed-Solomon codes. It is based on two sequential processes: interpolation and factorization. In most applications it is interesting to efficiently decode in real time. This paper discusses some parallelization results about the interpolation process, which is the highest time-consuming part of the Koetter-Vardy algorithm. 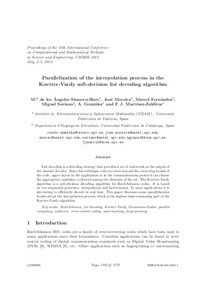 Moreira, J.; Fernandez, M.; Soriano, M. Parallelization of the interpolation process in the Koetter-Vardy soft-decision list decoding algorithm. A: International Conference on Computational and Mathematical Methods in Science and Engineering. "Proceedings of the 12th International Conference on Computational and Mathematical Methods in Science and Engineering". 2012, p. 1102-1110.